Watch Bangkok light up after dark with a 4-hour bike tour to markets, temples and local neighborhoods. 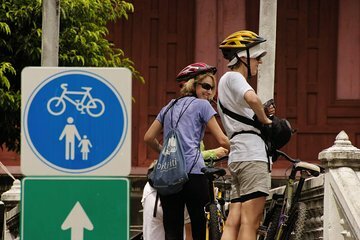 Pedal alongside your guide as you cross the Chao Phraya river, and pause to visit local temples along the way. Learn about life along the klongs, then follow narrow, atmospheric streets to the glowing Temple of Dawn. See an atmospheric former train station before boarding a ferry toward the elegant Grand Palace. Cruise the quiet paths of Sanam Luang park, and get perfect nighttime views of the city’s most iconic sites.